TLDR: 3 out of 5 for decent idea-driven SF with some bugbears and ok writing. Children of Time is the first SF outing by this author, and since he generally seems to be stuck on a fantasy-series treadmill (something I refuse to engage with) this is my first reading of his work. 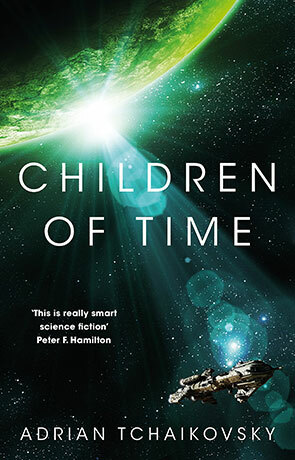 Children of Time is a stand-alone novel, though it does set itself up for a sequel [edit: and, in fact, a sequel is now announced for May of 2019 called Children of Ruin.] It contains several nods to Star Trek and Arthur C. Clarke, so I suppose those are obvious influences. In the distant future, earthlings have spread to the stars. One of them, Avrana Kern, is a mad scientist of sorts, head of a mission that is starting a grand experiment on a new planet, which is to be seeded with monkeys infected by a Nanovirus that will help them adapt and evolve quickly. "Nanovirus?" I hear you ask - what is that? It appears to be a made up word mashing together nano-bot and virus. It's certainly not a virus that's 10 to the minus nine the size of a normal virus. Nor is it this: https://en.wikipedia.org/wiki/Nanovirus. This little terminology snafu bugged me through the book. Anyway, something goes wrong and the monkeys don't make it to the planet. Fast forward into the even farther future and a large spaceship called The Gilgamesh shows up in orbit around this planet. They are warned by the automated defense system housed in a satellite that they must stay away from the planet at all costs because of an on-going experiment. The catch is that the Gilgamesh is a seed ship - it contains the last remnants of the human race in storage, and this planet is their last hope. (Gilgamesh, on his quest for immortality? That's an interesting allusion, at least). The defense system is armed - the Gilgamesh is not. However will this get resolved? More interesting that this, though biological Avrana Kern is long dead, her personality has been partially downloaded and is effectively the AI that operates the defense satellite, and she's somewhat unhinged, as you would be too if you suffered phantom limb syndrome for your whole body. And most interesting of all, although the monkeys didn't make it down to the planet, the nanovirus did find something to work on - insects - and there are several species of sentient spiders, ants, and presumably more, down on the planet who have evolved a nascent sentience, and which continue to develop into a full blown civilization over the course of the novel. Spider and Ant generations are short, and what's happening in space with the Gilgamesh is long, requiring a lot of hibernation, so the story of the humans unravels at one pace, the story of the insects on the planet unravels over the course of many generations. In the end, the two factions come to a head - they both need the same planet. The character of Avrana Kern acts as a kind of kingmaker, but an interesting one for being insane - will she side with the humans or with her experiment? Does the experiment still have meaning if the humans are no more? What happens when she finds out the experiment has gone awry? This is the core theme and it's a good one. Most interesting to me, though, is the exploration of spider (and ant) biology, evolution, and society. If the 'nanovirus' kerfuffle is anything to go by, this is all lacking in scientific rigour, but I'm not guru enough myself to detect the flaws, so it all 'felt good enough' to me. I rather enjoyed all this. Less good was the ham-handed attempt to be topical on the matter of gender. Females are dominant in both ant and spider worlds, and I suppose that Tchaikovsky wanted to jump on the bandwagon and use this as an opportunity to explore human gender relations - any why not. But I found the attempt to be far too obvious and even clumsy. People were doing this better in the '60s and '70s - and are doing it better today (Ann Leckie, for example). Another thing I didn't care for was the dialogue, which was a little too familiar for my tastes. Snarky characters who call each other 'fuckwits' don't do much to evoke the far future, in my opinion. Overall I found this book to be a mixed bag of things, but still a worthwhile read with quite a few good ideas. But for style reasons, I don't think I'll be rushing out to read more books by this author.